“I think we can get that Bulls record,” Rasheed Wallace proclaimed during training camp before the 2009-10 NBA season. A reporter asked the veteran if he wanted that one back. “You can (use it),” ‘Sheed confirmed, citing the team’s veteran leadership and dominant defense as the basis of his faith. That summer, the Celtics had signed the 14-year former NBA champion to a three-year pact. Wallace was expected to bring defense, dimension, and depth to the Boston frontcourt. He also unleashed a prognostication that later dogged a team that beat Cleveland opening night, grabbed six wins in a row, then 11 more, and demoralized the defending Eastern Conference champion Magic on Christmas day, racing out to a 23-5 mark. Wallace started the season hot, firing away at a 46 percent clip from downtown through his first five games despite looking like he’d wandered into TD Garden directly from the White House buffet line. By mid-winter, Boston was mired in what would become a 27-27 lurch to the end of the regular season, one they’d finish not with 72 wins, but with 50, good for fourth in the East, 12 fewer than the team cobbled the previous year with Kevin Garnett missing 25 games due to injury. ‘Sheed tumbled to less than 30 percent from deep. Their half-court offense resembled the old Bill Simmons “clogged toilet.” They gave up too many second chance points. They had a penchant for blowing big leads and didn’t get to the line enough. It was the most recent example of a Celtics team capable of so much but leaving their fans thoroughly confused. Sure, there are abundant differences between the 2009-10 squad and the 2018-19 edition. That was a veteran team, confident they could hit a switch when they reached the postseason, which they did, dispatching Heat in five, the Cavs in six (thus spawning a LeBron Monster who made eight consecutive Finals appearances beginning the following season) and the Magic in six before bowing to the Lakers in a classic seven-game finale. This year’s model is a deep blend of youth and veteran talent flanking one of the best players in the league, coached by a highly regarded tactician. But they seem to lack a blueprint that integrates all of those pieces. All we have now is a data set that says they’re a fine but uninspiring 26-18, even after pushing to 2-1 against the conference-leading Raptors by virtue of a thrilling, nationally televised win Wednesday night. Boston got a commanding performance from Kyrie Irving (27 points and 18 assists), showed lengthy glimpses of defensive tenacity, their bench performed admirably, and they received resilient supporting help from Al Horford and Gordon Hayward. It was the best of a squad once earmarked for 60 wins and the plurality favorite to meet the Warriors in the Finals. But they remain on pace for just 49 victories (or just one more than an Isaiah Thomas-led group of overachievers three years ago) and sit fifth in the East, six games behind the Bucks and Toronto at the top. We can only go by what our eyes can see and ears can hear. When Horford says “We play hard at times; we don’t play hard all of the time,” we’re reminded of the inconsistency between Wednesday and the group that dropped the previous three games to mediocre teams. It was even evident in surrendering a 16-point lead last night before closing things out. When Irving chides the team’s young players, we nod our heads and wonder what happened to the confident bunch that pushed LeBron to Game 7 of the conference finals last spring. When Jaylen Brown retorts, we wonder if de facto leader Irving is grating on a roster where the other veterans of note are mild mannered (Horford), going through their own issues (Hayward), or destined for another ZIP code next summer (Morris, who is having perhaps the best season of his career). Considerations have to be made for performance. Like Garnett in 2010, dragging his leg up and down the floor during a campaign when his numbers sank to career lows of 14.3 points and 7.3 rebounds in under 30 minutes a night, Hayward has been a shell of what the Celtics envisioned when he signed a massive four-year deal 18 months ago. Like a banged-up Garnett, he’s capable of the occasional eruption (18 points and 5 dimes on 8-for-13 shooting Wednesday), but he’s somewhere between pedestrian and invisible other nights. Horford has also experienced a decline in his contributions, leading to questioning as to whether Brad Stevens killed the 11-year veteran last spring, when the big man logged 36 minutes a night in the playoffs against the likes of Giannis Antetokounmpo and Joel Embiid. Horford has also been bothered by knee issues, and while the Boston defense still ranks among the best in the league, it occasionally lags, much like it did in 2010 when anchor Garnett struggled to find his footing. Like late-career KG, Horford’s statistics may not be All-NBA level, but his across-the-board contributions are invaluable to the team’s success. Aron Baynes (who returned Wednesday) has been missed, just as the Green lost Glen Davis in 2009 to a broken thumb sustained in a drunken wrestling match with a friend, in addition to free agent pickup Marquis Daniels, who sat for 31 games. Eventually, the rent comes due. The 2010 Celtics, despite their uninspiring regular season output, had veteran leadership, multiple players capable of elite performances, a budding young star to fill the gaps, and a mission statement. Different from the "Ubuntu" team of two years prior, the Wheelchair Celtics slogged through a New England winter to get to spring. Doc Rivers and company paid lip service to losses but knew bigger things were ahead. Theories weren’t advanced in the media as to why things weren’t clicking. Beef stayed in the locker room. With everyone on the same page, they morphed back into a group for which anything was possible. 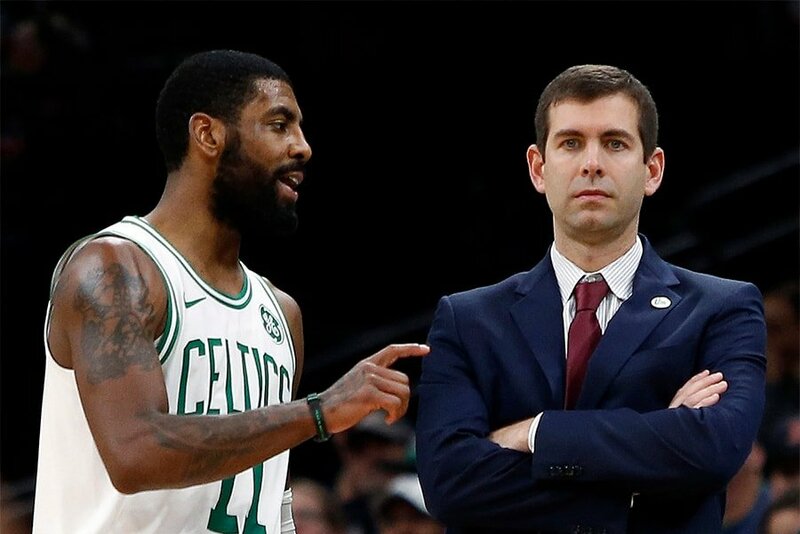 Does Brad Stevens have a mission statement for 2019? It’s easy to get lost from night to night. There’s a need to embolden their young core, suddenly unsure of its footing after the successes of last spring. They want to get Hayward back to an All-NBA level of performance, while keeping the 32-year old Horford in bubble wrap until April. Terry Rozier is clearly looking for a fat contract. Irving’s negotiations loom large, as does the romantic notion of an Anthony Davis deal. All of the subplots are distracting from the assumed goal of getting to the Finals for the first time in nine years. The 2010 Celtics were always going to be about Paul Pierce, Ray Allen and Garnett. Emboldened by a five-year, $55 million extension following a 2009 playoff run that saw him chuck 16 shots a night, averaging 17 points and 10 assists in trying to keep the ship afloat, Rondo asserted himself when necessary, knowing he wouldn’t have to carry the team with regularity. While his overall numbers took a step back, it was clear that the Big Three had become a Big Four. After Irving, which one of the 2019 Celtics assumes that mantle? Most frequently, it has been Morris. Do we believe Jayson Tatum, in the current offensive structure, can take over a game like vintage Rondo? Last night, Hayward took a step forward, while Horford tallied an uncharacteristic 24 points. But how often can those performances be expected? And do these players trust one another? That remained for the 2010 squad even as they fumbled away regular season contests to terrible teams. Wednesday night was a signature win, but it took a Herculean effort from Irving, at home on the TD Garden parquet. The Celtics have dug themselves a hole to the extent that if the two teams meet in the postseason, they’ll likely spend more time in Canada than Boston. For one night, the supporting performances inspired and the postgame comments were glowing. But there are miles to go and questions to be answered before Celtics fans can feel comfortable with this team. It starts with unity of purpose and the Green developing a level of comfort with themselves.